South Node, 29 Leo in the 10th of the country’s rulers. Maybe that’s why Clinton called Bashir Assad’s father (who ruled for 29 years, one full Saturn cycle) “The Lion of Syria” when he died. 29 Leo is Regulus, the king star. 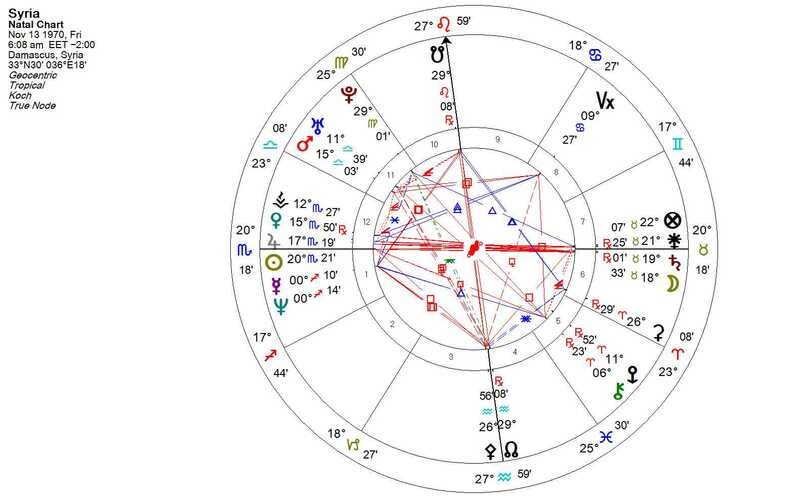 Syria’s Mercury-Neptune conjunction in religious orders Sagittarius squares transiting Neptune at 0 Pisces. Dissolution. Dissolving phase for the country. Neptune is still in orb of conjunction to Syria’s North Node at 29 Aquarius in the 4th house: foundations of the nation are dissolving from under the ruler (North Node on Regulus in the 10th). 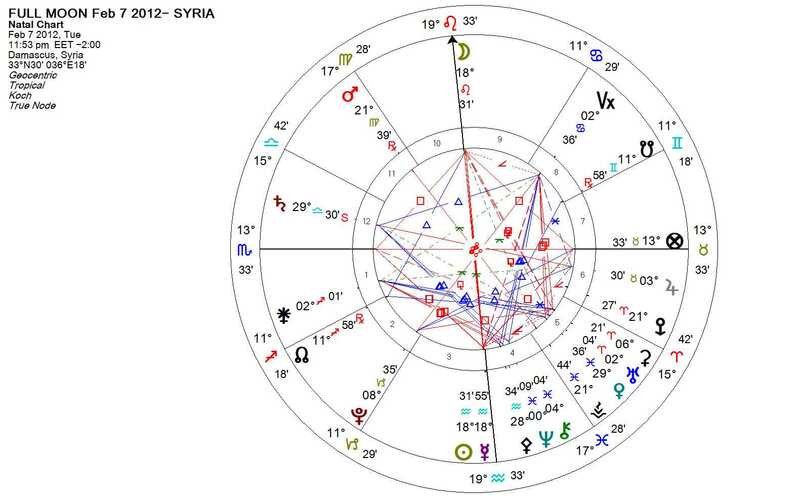 Syria’s Saturn retrograde at 10+ Taurus lies in square to today’s Full Moon at 19 Leo. Bashir Assad was born 9/11/65 in Damascus (no time known) during the Uranus-Pluto conjunction in Virgo phase. His Sun is also conjoined to that generational/cultural world change configuration. Of course, we know what the current Uranus-Pluto square signals: world upheaval/a rebuilding upon the ashes of the old. The old is being torn down by Plutonic power rot. Uranus is the revolutionary/anarchist/freedom fighter or terrorist. 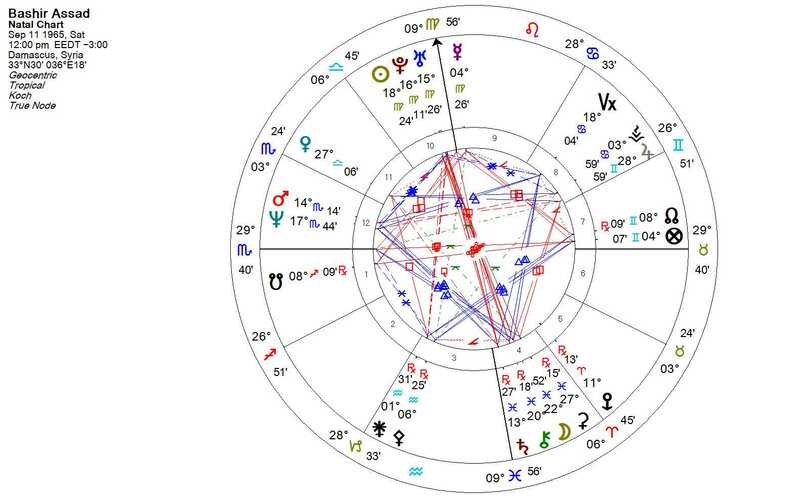 Bashir’s Lunar Nodes fall along the 8 Gemini-N/8 Sagittarius-S axis so for a second year his nodes are connected to the eclipse cycle. By Transit, Assad is set to experience a nodal reversal, and that’s always a rough time. His progressed Neptune is 19 Scorpio, conjunct Serpentis, the coiled serpent. The ancients called this position “The accursed degree of the accursed sign.” aka/ “North Scale – brilliant mind, the accursed degree. 18 Scorpio 59”. “A malefic degree, tragedy, misfortune, the “Accursed Degree”. This degree does not precess.” I can’t remember where I read this, but I recall a link between Neptune, Mars and Chiron with torture, torturers and the horoscopes of Hitler’s henchmen. I don’t recall mention of 19 Scorpio (Serpentis) being in that mix. Dr. Josef Mengele was a Pisces with Neptune at 18 Cancer, a true believer who took his experiments to a ‘religious’ extreme (Neptune trine Jupiter). Assad is also a doctor — an ophthalmologist who can’t seem “to see” and is on his way out. She moves today at the Full Moon into warring Aries and connections with revolutionary Uranus on the 9th. I think that signals a world hew and cry for women’s rights including in Syria, Egypt, India, etc., and also here in the USA more on the Susan G. Komen/Planned Parenthood mess. Off the cuff speculations for this rainy Tuesday afternoon . . .